There is a saying that goes “The nose, knows…” which is applicable when talking about a reliable way to aid in choosing your cannabis. Cannabis flowers and concentrates will often put off a fragrant smell that you may find very pleasant, or sometimes even rather unattractive. This smell will help each person determine whether or not they may like the high associated with that cultivar of cannabis they are observing. Lets explore a little bit more about terpenes and where they occur in nature. 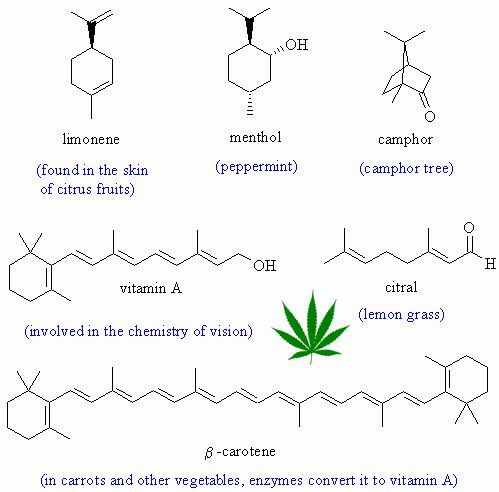 A group of chemical compounds that give many of the things in nature their natural fragrance are called terpenes. For instance, oranges have a very distinct citrus smell to them when they are peeled. This is because they produce a large amount of the terpene called Limonene. Many different citrus fruits produce limonene, as well as a variety of other terpenes in varying levels which help to create the unique smells that each fruit produces. Terpenes play an important role in the overall effect of the high that we experience from consuming cannabis. They can even dictate how the cultivar is named as well. With names like Mango, Blueberry, Strawberry Cough, Cheese, and Cherry Pie, it is common to find terpene profiles from something that smells similar to the cultivar that you are growing or buying. Terpene profiles are also unique to each growing environment and inputs, so two different farmers growing the same plant might even have a slightly different smelling end result. Having a better understanding of terpenes and their effects on you personally will help guide you to the right type of cannabis for each situation. In part 2 of this series, we will be talking about what terpenes do and the different types of terpenes that are most commonly present in cannabis and how they affect you.